I fear I’m a little late with this one. After all, Memorial Day has already come and gone, and even if the calendar still says “spring” for another three weeks or so, in most people’s minds it’s already summer. But before you get distracted by that display of corn at your local farmer’s market, let me call your attention over here—to this strange looking green vegetable that’s available for another month or so (and then again for a brief return appearance in the fall). I’m referring, of course, to the artichoke, whose prickly appearance and somewhat demanding cooking and eating requirements has scared away more than its share of otherwise adventuresome eaters. That’s too bad, because not only is the artichoke packed with things most of us need more of (antioxidants, fiber, plus other benefits you can read about here), it has a wonderful, slightly nutty flavor that plays well with ingredients many of us can’t seem to get enough of—namely butter, mayonnaise, garlic, and lemon. Alright, so maybe the butter and mayo negates those health benefits, but I call it a fair trade for something this good. Still, I can relate to those hesitant to commit to the artichoke in the produce aisle. 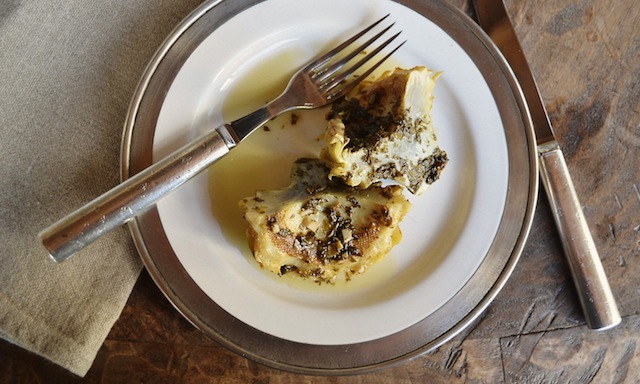 Long after I’d started ordering them in restaurants, I was wary about cooking artichokes myself. And then once I’d mastered the art of steaming them (because at it’s simplest that’s all that’s required—just a large pot, some boiling water, and a quantity of cheesecloth to keep the little gremlins from bobbing to the surface during the half hour or so needed to get them ready for eating) anything more complex seemed out-of-reach. Well, I’m happy to report I’ve officially moved past my artichoke-cooking phobia, having now graduated to the recipe I bring you here. It’s an excellent one, from the fine ladies at Canal House (you’ve met them here before), and is one of those that stopped me in my tracks the moment I saw it, demanding immediate action. One reason for my reaction was the name, “Artichokes Roman Style,” though I’m also a sucker for a tantalizing photo, and the image accompanying the recipe was hard to ignore—a cluster of halved artichoke hearts glistening in what looked like lemony olive oil and flecked with what I assumed were a variety of herbs. How could I say no to that? Well, of course, I couldn’t. Though first I read on, and what I learned is that this particular preparation (as you might expect from the title) is one associated with Italy’s capital city. It’s also—and this I discovered in another recipe, namely one that ran in Gourmet in April, 2009—a dish with roots in that city’s Jewish community, the oldest in the Western world. Jewish? Italian? Jewish/Italian? It all sounded good to me! So, too, did the fact that what I’d assumed to be a lemony olive oil was, in reality, a mix of white wine and olive oil, used to braise the artichokes and then reduced to a sauce spooned across the cooked vegetable. 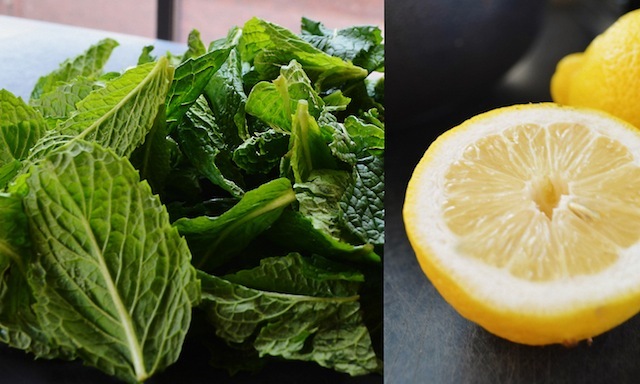 And then I learned that what I’d taken for a variety of herbs was just one—namely mint (mint! ), mixed with a few cloves of chopped garlic to form a kind of stuffing for the artichoke. So let me repeat: olive oil, white wine, mint, and garlic—all that, and an artichoke, too. Reader, I pretty much ran to the market. Once armed with the necessary ingredients, it was time to tackle the tricky part of the vegetable—namely those prickly outer leaves and the silky beard nestled at its center (and aptly called “the choke”). Still, how hard could that be? So as directed I broke away the outer leaves, snapping them in such a way as to leave behind the meaty bits at their base. Eventually those thick, rubbery layers give way to softer, paler leaves, and these I trimmed with a paring knife, 2 inches or so from the top. As for the stem, as instructed I cut this to about one inch in length, removing the outer layer with a vegetable peeler, and using the paring knife to trim away any tough, fibrous bits on both the stem and the base of the artichoke. And to keep those points of contact between the knife and the artichoke from turning brown, the recipe suggests rubbing them with the cut half of a lemon (this worked just fine, though alternately you can do as the Gourmet recipe suggests, and drop the prepared artichoke into a bowl of cold water, to which you’ve squeezed two lemon halves). In any case, easy enough. Slightly more complicated (and only slightly, I promise) is the process by which that choke is removed. It’s simplest if you tackle this with a melon baller or even a grapefruit spoon (the kind with the tiny serrations), though if you don’t have either of these just use a small sharp spoon (I used a run-of-the-mill teaspoon) to scoop out the fuzz, aiming for just below the base of the strands where they meet the top of the artichoke heart. The procedure requires a little muscle, though it’s over quickly enough. More challenging, however, was the instruction to “spread” the remaining leaves apart to allow access to the choke—a process that invariably led to those leaves snapping off at the base. I was more successful with this when I simply wedged my spoon through the tiny opening presented by the leaves, letting the movement of the spoon spread them naturally. Either way, if the leaves break off (which they probably will), don’t sweat it—the dish will work just fine without them. I mention this last point because the goal is to pack the center of the artichoke with the mint and garlic combo mentioned above (presumably within the cup formed by the top of the heart and the inside of the remaining leaves), and then to place the vegetable, stems up, in a heavy non-reactive pot (in other words, no aluminum or cast iron). Given that I was about to pour a cup of olive oil on top of the artichokes, followed by a bottle of dry white wine, I worried that the mint and garlic would simply float away without the requisite artichoke leaves to hold the mixture in place. Well, I was right to worry, as much of the garlic and mint mixture did fall away. In the end it didn’t really matter, though, since it’s ultimately via the braising process that the flavors of the herb and garlic infuse the artichoke, and not via direct contact with the vegetable that the exchange occurs. So rest assured those flavors will come through loud and clear, as does a hint of lemon—a surprise bonus from having rubbed the artichokes with the cut lemon earlier in the process. While the recipe does not specify cooking time, the ones I made (all of which were slightly larger than a baseball) required just over a half hour on the stove at medium heat, covered. 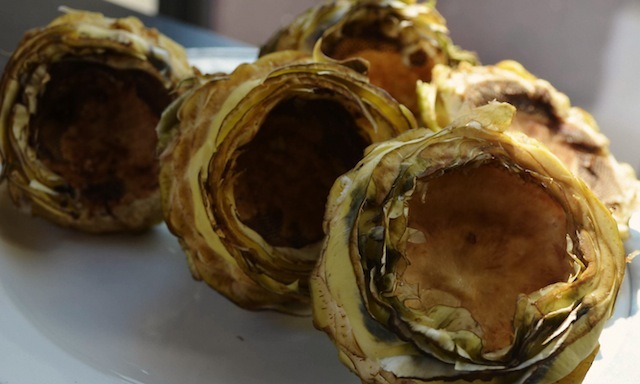 Regardless of size, however, you’ll want to periodically check the artichokes for doneness by piercing the base with a sharp knife (they’re ready when very tender). Use caution here, however, as the wine in the pot can ignite, as it did the second time I lifted the lid, creating a brief flare up that I discovered hours later had cost me a quarter inch off the hair closest to my forehead. (I’m laughing about it now—“Needed a haircut anyway, haha”—but obviously this could have been much worse, so please be careful!) 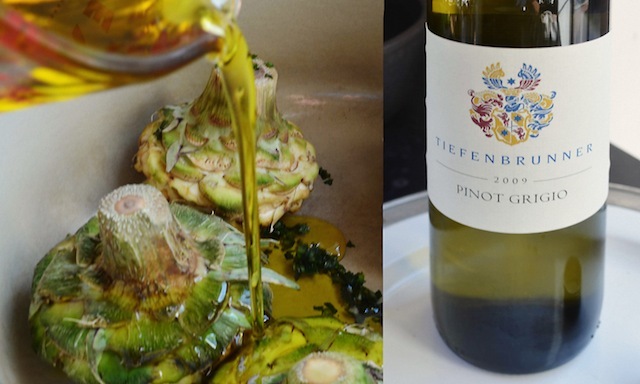 In any case, once the artichokes are knife tender, remove them from the pot with a slotted spoon, then raise the temperature to medium-high and reduce the wine and oil by half. Spoon this across the artichokes (I prefer them cut in half but whole is fine, as well) and serve—right away, ideally. There are many methods of cooking, and eating, an artichoke but I love this preparation for the way the olive oil and white wine balance the pleasant nutty taste of the artichoke, and for the way the mint draws out the vegetable’s subtle sweetness. That said this method shares one overriding characteristic with most others—it’s best enjoyed alone on your plate, as a precursor to whatever dish might follow. In fact, the flavors of the artichoke are such that no beverage works quite as well with it as a tall glass of water. This for the simple reason that all the usual suspects—wine, beer, what have you—end up fighting the lovely metallic flavor that tends to linger on the tongue after each bite. I love all those qualities, and I love that I no longer have to rely on a restaurant to provide them for me. I’ll come back to this recipe again and again. 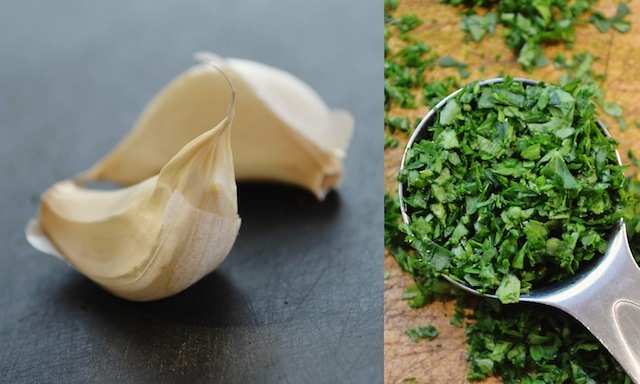 —Mix together the mint and garlic in a bowl and add a splash of olive oil. 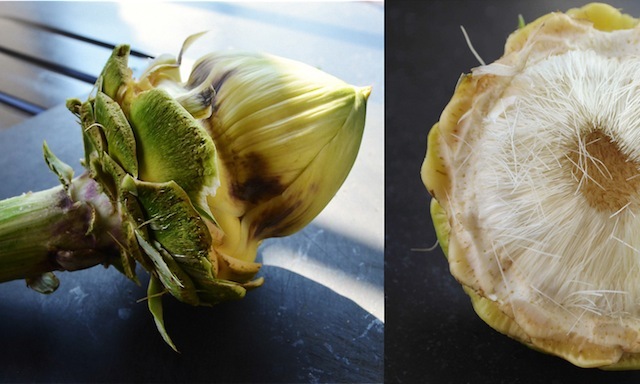 —Pull off and discard all of the tough outer leaves of the artichokes (snapping off the leaves just before the bottom to leave behind the meat at the bottom of the leaf) until you get to the tender, pale green inner leaves. Slice off about 2” from the top. Peel, then cut the stems to 1”. Use a sharp pairing knife to trim away and smooth the stems and bottoms. As you trim, rub the flesh with the cut lemon to prevent the artichoke from turning brown. —Spread the leaves apart and use a melon baller or small sharp spoon to scoop out and discard the hairy choke. 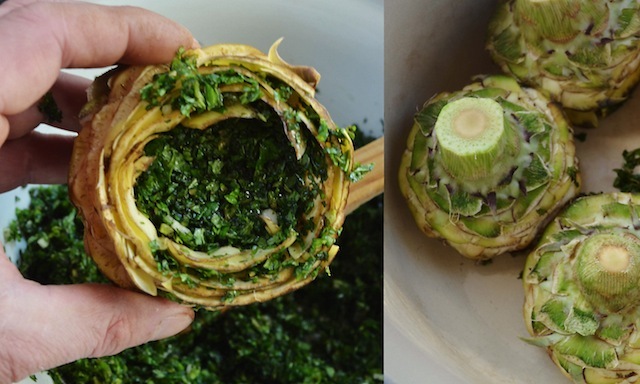 Pack inside the artichoke and between the leaves with the mint and garlic. 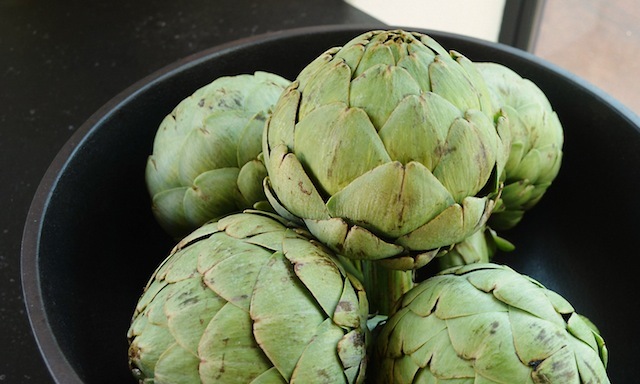 —Arrange the artichokes stems up in a large heavy nonreactive pot (not aluminum or cast iron). Pour the oil over the artichokes then pour in the wine. Season with salt and pepper. Cover and cook over medium heat until the artichokes are very tender when pierced with a knife. 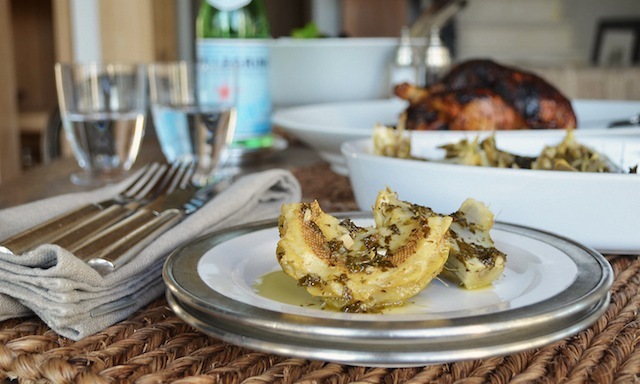 —Transfer the artichokes to a platter, set aside, and allow to cool. Increase the heat to medium-high and reduce the wine and oil by half. Meanwhile, when cool enough to handle, cut the artichokes in half lengthwise or leave them whole if you prefer. Spoon the sauce over and serve. This looks amazing! 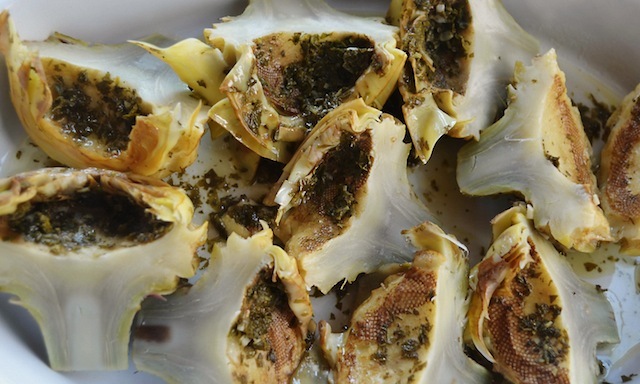 I love artichoke and what better way to eat it than with olive oil and garlic? Thank you for a beautiful and thoughtful blog--well worth reading. I just subscribed. Thanks for the nice message Katherine. Very happy to have you aboard!